This was the first proper fish I cooked and found it really easy to prepare. You simply poke a hole in the wrapping and cook in the microwave to get delicious salmon. It tastes absolutely delicious and can be paired with a lot of different things to create delicious meals. 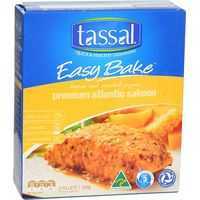 How would you rate Tassal Easy Bake Salmon Lemon & Pepper?